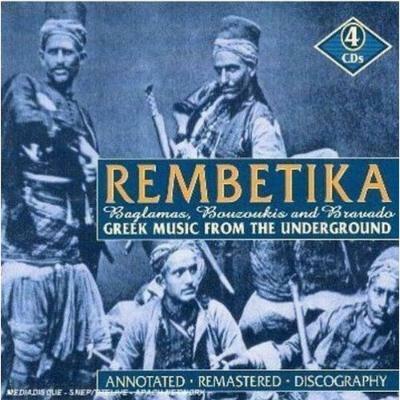 There are many compilations of Greek Rembetiko music, but I chose this one because it has some classics on it that I’ve been aware of for a long time. In the early 20th-century, after the First World War after Kemal Atatürk came to power in Turkey, there was an exchange – to put it politely – an exchange of population between Greece and Turkey and was extremely unpleasant at the time for both countries. At that time, a lot of Greeks who had lived in what’s now Turkey for a really long time, moved over and came to Piraeus as refuges and brought this music with them which was a mixture of Greek central European and Asian or western Asian sort of music and it evolved into this form of street music played by these guys called Mangas – the wide boy, gangsters, hoodlums of Piraeus in the 20s. It’s funny in Greece still today; some people don’t like to be reminded of that side of Greek history. It’s seen as anti-bourgeois – it’s the only way I can put it. The songs were about whores, smoking dope, stabbing your mates or being done over or sticking up for your mates – these classic themes – but because they were sung not only in Greek but in an impenetrable dialect that most modern Greeks would find hard to get their head around, though it didn’t really get that far past Greece itself. The history is fascinating but the music is like nothing else that I know. Also, even though I grew up in Scotland, I still feel this strong connection to the Greek side of my background, and when I listen to this music I feel I can connect with this history that I know preceded me and I don’t have a direct contact with myself, it’s a way I can understand a little bit of where I came from.